Please don’t yell. I’ve been called out in the past for picking books that are impossible to find and I’ve been real good about it for such a long time now but I’ve come to a breaking point, I simply can’t continue my Spotlights without addressing this comic. 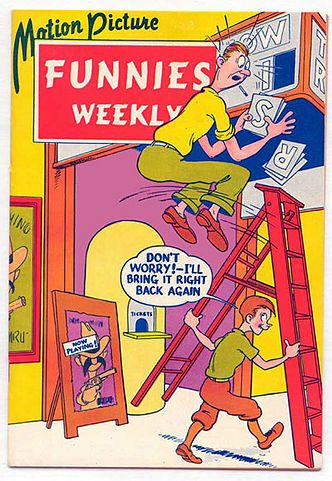 Motion Picture Funnies Weekly #1 is different from most Golden Age keys, it almost defies description, it pushes past legend and enters into myth. 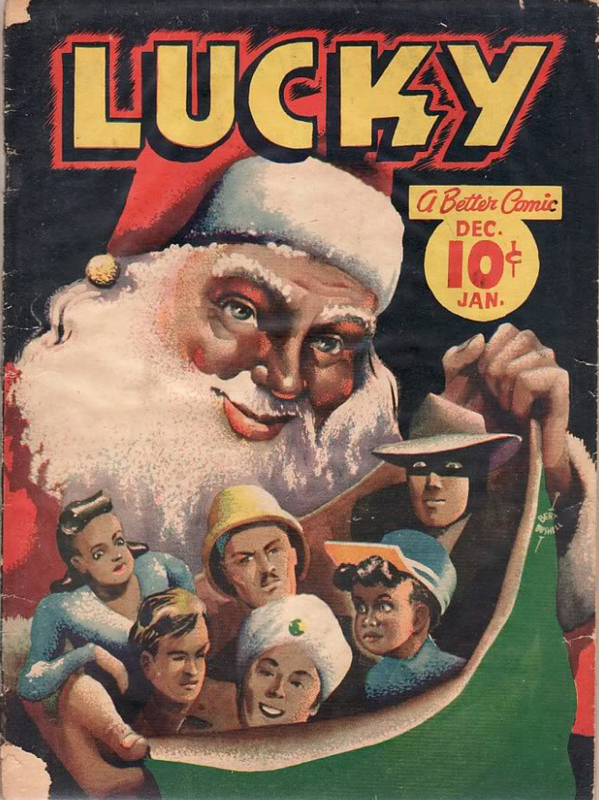 A promotional comic planned to be given away at movie theatres in 1939; it ran into a snag when the theatre company it was pitched to didn’t like the idea. In 1974 when 8 copies of the then forgotten comic were found comic history, namely Marvel Comics #1 history, had to be rewritten. A 9th copy, the now famous “Pay Copy” surfaced later and as of this post these are the only 9 copies known to exist. Of these 9 books 7 are CGC graded, 3 of these are restored. The “Pay Copy” graded a CGC 9.0 is also the highest graded. In October 2005 the “Pay Copy” sold for a measly $43, 125. It is called the “Pay Copy” by the way because someone wrote payment info for the book’s contributors right on the comic. 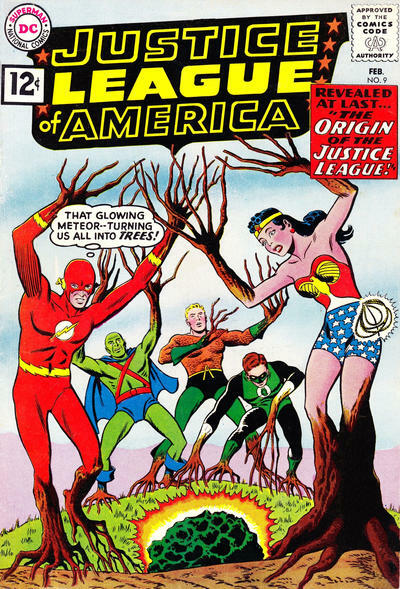 The most recent recorded sale of this comic was as recent as February 2009 when a CGC 5.5 sold for $20,315. The actual comic is a 36 page advance copy (prototype) of the planned theatre giveaway. What makes the comic a major key is that it contains an 8 page story introducing Namor the Sub-Mariner by Bill Everett. 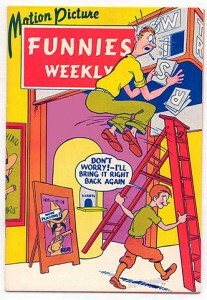 Later in 1939 Everett expanded the original 8 page Motion Picture Funnies Sub-Mariner story to 12 pages for publication in Marvel Comics #1 (October 1939). Sub-Mariner predates Batman and the character is such an integral part of the Marvel universe I just don’t understand this book realizing a little above 10% of what comparable copies of Marvel Comics #1 would trade for. Going back to Overstreet Guide #8 (1978) I believe this comic was ranked 3rd in value only behind Marvel Comics #1 and Action Comics #1. What happened? It’s obvious to me that the Overstreet Guide and the market (limited as it may be) are both undervaluing this book. Sales have occurred in 2002, 2005, 2008 and 2009 and, like an overdue volcano or earthquake, I feel this one is due. Will a copy of this book surface soon? I hope so. When it does will you be ready? The 43rd edition of the Overstreet Comic Book Price Guide shows $5,000/$10,000/$15,000/$25,000 and $35,000 as the 2.0/4.0/6.0/8.0 and 9.0 price splits. walt, yes very undervalued, but as you might be aware the ages old debate whether which comic appeared first mpfw or marvel1 remains unresolved. Interesting pick Walt. The difference between MPFW #1 and Marvel Comics #1 is indicative (IMO) of how collectors prefer the “regular comic book format” over a less regular format because MPFW #1 is a promotional publication. Lots of examples n the comic book world. I think of the 1st appearance of Rocket Raccoon as a similar modern example. Rocket first appeared in Marvel Preview #7, which is a magazine, but collectors seem to prefer the later appearance in Incredible Hulk #271 (1st Rocket Raccoon in comics). Also, Marvel #1 will always be worth more because it’s the first appearance of the Golden Age Human Torch and Namor, so it also launched two thirds of the Golden Age Marvel universe (the other third started in Captain America Comics #1). peter, i too am biased toward the marvel1, but to be fair the first appearance of subbie is still unresolved,with strong evidence presented from both camps. The Sub-Mariner story here is dated April 1939 and I’m sure Everett didn’t compress the 12 page Marvel #1 story into the 8 page MPFW story so I am presenting this book as Subby’s 1st appearance. As far as its value versus Marvel Comics #1 I don’t expect it to be worth even half. But as I pointed out this used to be a massively big book, top 3 in value at one point for collectors. I understand that it being a promo hurts it a bit, you are right Peter but for its scarcity and for the Character it introduced it should be realizing 3 times more than it has historically been getting. according to warren reesewhom i have corresponded with off and on over the years,marvel1 is first. he wrote an extensive article for alter ego several years ago. read it and draw your own conclusions! A portion of that article from Alter Ego issue 108 can be read here. I’m sorry, but I was unclear about your point. Is it always true that collectors prefer a more traditional format over unorthodox formats? With respect to the example that you offered (and which I’ve actually heard several people make), I’ve actually seen Marvel Preview #7 selling at higher prices than Hulk #271 whether raw or slabbed. Thus, if a magazine format (without the character on the cover) is selling for more than the subsequent comic book (with the character on the cover), then maybe MPFW’s promo status shouldn’t be hurting its value (and won’t in the future). Good point about the Rocket Raccoon comics. Yes, you’re right that the Marvel Preview 7 (magazine) is worth more than Hulk # 271 (first Rocket Raccoon in comics). I should clarify that if a collector prefers the news stand comic of a character over the true first appearance in another format (e.g. Marvel Preview #7 of Rocekt Raccoon), it doesn’t necessarily mean that the first news stand comic edition is worth more. And no, it’s not always true that collectors prefer the more traditional format over the unorthodox format. I should clarify by saying that SOME collectors do want the Hulk #271 over Marvel Preview # 7 because it’s a regular comic book format, even though Hulk #271 is worth less. Another example would be Conan the Barbarian, who first appearing as a short story in the Weird Tales magazine in 1932. This magazine regularly sells for thousands of dollars on eBay, etc. But the first mainstream comic edition of Conan came out in 1970 (Marvel’s Conan the Barbarian #1) and is obviously worth less because there are a lot more copies available of the Marvel Conan #1 from 1970. Yet a collector may want to buy the Marvel Conan #1 rather than the Weird Tales Conan issue because the Marvel Conan #1 is the first mainstream comic edition of Conan and it was drawn by Barry Windsor-Smith. Getting back to the MPFW#1, a certain collector may want to buy Marvel Comics #1 because it is the first mainstream comic appearance of the Sub-mariner, even if it is more plentiful and even if it was published after MPFW #1.
thanks Scott for getting that info. out there. By the way,marvel1 oct cover copies should be regarded as 1st printings and the nov. cover overprint as 2nd printings. It’s amazing how all these decades this point has eluded collectors and not notated in Overstreet as such! !